I asked her where she saw it and Gwen replied that her husband spotted it on the Ho Seng Kee Facebook page and showed it to her. I assured her that I was aware of it because Elton Ho, the third generation operator of the Mee Ho Seng Kee brand of noodles, told me that he had planned to run this special offer at his noodle café during November 2018. Like Gwen and her husband, my family and I have been enjoying the distinct taste and texture of the Ho Seng Kee brand of kon-lo-meen (Cantonese) wanton noodles for generations. The Ho brand of wanton noodles, first served by Grandfather Ho from a push-cart – a mobile stall that used to ply along Jalan Siew Nam and Jalan Meldrum – during the pre-war years, has since moved into a permanent stall in coffee-shop and more recently, Elton boldly changed its operations and moved the business into a mall! I’m familiar with how this business had moved to serve at different locations, and followed it to the various coffee-shops in JB, just to enjoy the taste of their noodles. I also discovered that beside my aunts, there were other fans of these noodles who even ordered the raw noodles and it’s sauces for takeaway so that these may be kept in deep-freeze and hand-carried or air-flown to various destinations! As I got to know Elton who first served these noodles alongside his father, Mee Ho Seng Kee was one of the local popular brands that I proudly featured in the Food pages of Travel Times, when I first contributed to this pull-out section of The New Straits Times. 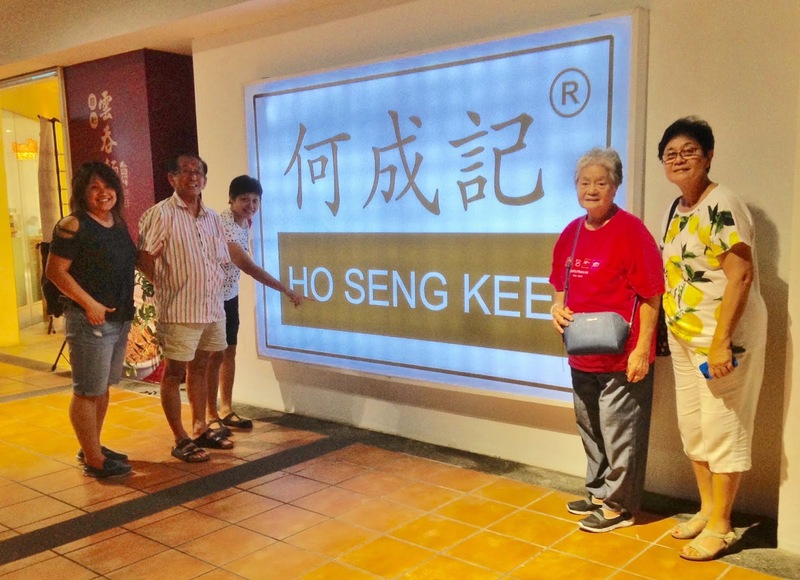 When I was compiling the contents for my book sequel – in collaboration with Think City and MPH Publishing – I decided to include Mee Ho Seng Kee as one of the subjects under Heritage Traders who are still doing business today but interestingly, in a different format. That’s because Elton had moved his family business which started from a one-man-operated-push-cart into a modern, air-conditioned café within one of the most popular malls in our city. I remember Elton told me that regulars bemoaned the fact that they cannot simply walk into their neighbourhood shop to enjoy their daily/regular bowl of kon-lo or dry-tossed, hand-made noodles. For some folks it was rather ‘challenging’ to head into the mall for their favourite bowl of noodles. Any change was traumatic but Elton braved the challenges and worked hard to keep regulars coming in while he welcomed new fans of his family recipe of noodles. These are shoppers in the mall who soon became regulars because they could have a convenient noodle snack anytime between 10 am and 9.30pm daily, in the mall. As he trained a kitchen team to serve his family recipe noodles efficiently, Elton has taken his family’s wanton noodles business to a new level. In the café, there are posters that depict some of the processes to produce the hand-made noodles and a large screen television displays a short video of the production process along with coloured photos of their products. My aunts, who have relocated to live in Kuala Lumpur, told me that have yet to find a wanton noodle elsewhere that rivals the taste and texture of Ho Seng Kee noodles. So when they come back to JB or when we have relatives visiting JB, the food trail will inevitably include a meal at Ho Seng Kee. After my manuscript was approved by Think City and sent to print with MPH Publishing, I moved on to planning the next stage of the project – my book launch. MPH Publishing graciously gave me the privilege to submit my book preorder with a discount exclusively enjoyed by author, which I shared with the subjects in my book because I was sure they would want extra copies to present to their family and friends. As the subjects in my book replied with the number of books they wished to preorder, Elton also responded with his preorder for 30 books! Surprised at his preorder for such a large number of my books, I quizzed him about it. I reminded him that this preorder is specially offered to the subjects in my book to let them enjoy the discount for extra copies to present to their family and friends. Then Elton told me about what he planned to do with the 30 books. To share with diners at Ho Seng Kee, the story about his family business documented in my book, this innovative entrepreneur had the bright idea to hold a Lucky Draw for diners to win my book! He explained the mechanics of this Lucky Draw which turned out to be simple: From Nov 1 to Nov 30, diners at Ho Seng Kee who wished to participate, are invited to write down their name and contact number on their order receipt – both dine-in and takeaways – and to drop it into a box. After my book launch, Elton will draw out 30 receipts in early December and these happy winners will be notified by WhatsApp to collect their books from Ho Seng Kee! To design a poster to announce this Lucky Draw in his café, Elton asked me for the cover design of my book, My Johor Stories 2: Interesting Places and Inspirational People. At that point, I could only share the mock-up copy of its design but it should do. So this was used in the poster which Gwen and her husband spotted on Facebook! Yesterday, a friend who went to dine at Ho Seng Kee, saw that this poster was already on the wall and he even took a photo to show me! After its launch in December, my books will be available from MPH bookstores nationwide and on line from www.mphonline.com. And if you like, you can also dine/takeaway noodles at Ho Seng Kee and drop your receipt into the box, to stand a chance to win an autographed copy of my book! 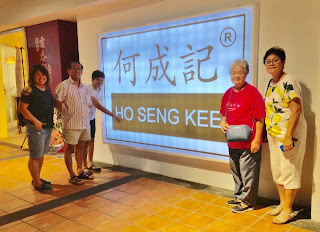 Ho Seng Kee [Non-Halal] noodle café is located at Level 6, Johor Baru City Square, Jalan Wong Ah Fook, 80000 Johor Baru.